Cargo control is what we stress here at Mytee Products. What began as a small, local company specializing in truck tarps and straps has grown into a retail operation with a national reach. Not only do we still carry truck tarps and straps but we also carry just about every piece of cargo control equipment an American truck driver could possibly need. That includes load bars and e-track. We do what we do because cargo control should be a part of every trailer and every load. Experienced truck drivers know that cargo control is not just a flatbed issue. Even dry goods vans and reefer trailers cannot be operated safely if the cargo within is not properly secured. Police reports say a tractor-trailer hauling 40,000 pounds of liquid on 17 pallets turned on its side in the early morning hours of September 22. Apparently, the driver failed to properly secure the pallets. They shifted as he drove down U.S. 70, causing the trailer to tip on its side. The driver was not injured, but the truck was heavily damaged and the entire load of liquid was lost. The biggest lesson to be learned here is that shifting cargo is dangerous. Truck drivers are well aware of the dynamics of shifting cargo when it comes to loads on flatbed trailers. They know all about using blocks, chains, straps, and winches to secure things tightly in place. They know about working load limits and how to properly distribute weight across the trailer. Unfortunately, what is taken for granted with flatbed trailers is often ignored for dry vans and reefer trailers. Yet as the above stated crash demonstrated, shifting cargo can be just as dangerous when goods are enclosed. Cargo has to be kept in place at all times, otherwise disaster is just one shift away from striking. One of things we stress here at Mytee Products is our belief that truck drivers should be cargo control experts. Yes, there are engineers who work out working load limits, tensile strength, and the other calculations necessary to properly rate things like chains and straps. But it is U.S truck drivers who apply those chains and straps in a real-world setting. They need to be the experts in how it all works. Whether a driver is securing pipe to a flatbed trailer or filling a dry goods van with pallets of liquid, a basic understanding of physics comes into play. 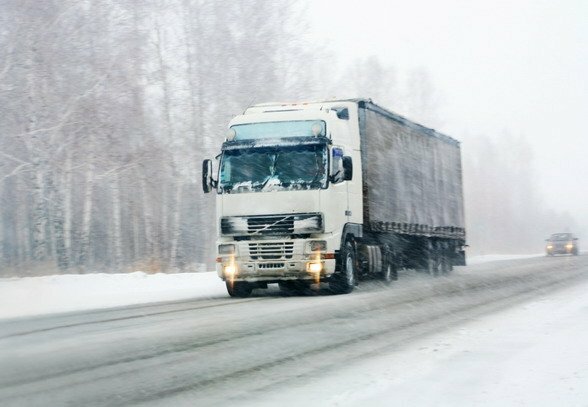 The energy stored in cargo as a truck is moving – known as kinetic energy – will force that cargo to continue moving in the same direction unless something prevents it from doing so. Cargo control principles are designed around doing just that. A truck driver should know that unsecured cargo in a dry goods van is likely to shift as a trailer turns. Kinetic energy forces it. Therefore, load bars should be put in place to prevent dangerous shifts. If there is empty space between cargo and the sidewalls of the trailer, either that space has to be filled or the cargo needs to be secured with straps to prevent it from moving. It is fortunate that the North Carolina accident did not result in injuries or death. It is equally unfortunate that failing to secure cargo resulted in financial losses for both the trucking company and the shipper. The accident provides all the evidence truck drivers need to understand just how important cargo control is. Our regular customers know that Mytee Products carries heavy-duty bungee straps made with 100% EPDM rubber. They also know that EPDM bungee straps are ideal for flatbed trucking, where straps are expected to withstand a tremendous amount of punishment day in and day out. In light of that, we want to use this post to point out that your choice of bungee straps really does matter. As a truck driver, it would be a good idea to choose a bungee strap that is appropriate for the kind of work do. The first two options were detailed in a Mytee Products blog post a while back. At the time we excluded the Nylon wrapped rubber. We feel it is time to include that third option now that it is more readily available at DIY stores. When Charles Goodyear first developed vulcanized rubber in the mid-19th century, it revolutionized the way natural rubber would be used for industrial and manufacturing purposes. His vulcanization process led to the development of rubber car tires along with an extensive list of utilitarian items such as hoses, gaskets, and belts. Natural, vulcanized rubber was critical to the war effort in World War II as well. As a material for bungee cords, natural rubber is strong and fairly resilient. It holds up well in most kinds of weather with the exception of excessive heat. High temperatures and direct sunlight can cause natural rubber to lose some of its elasticity. EPDM rubber is a synthetic product that was created to make up for the severe shortage of rubber during World War II. It proved to be a better material for a lot of different uses, and it is the predominant form of rubber used today. Most of the bungee straps truckers use are EPDM rubber. The strength of the EPDM is that it holds up exceptionally well in hot temperatures and under direct sunlight. But unlike natural rubber, it does not do well in extremely cold temperatures. Cold EPDM is prone to getting brittle and breaking or tearing. Nylon wrapped rubber bungee cords are those cords you see being sold in different colors. Some are red, others are blue, and still others are yellow or green. The most important thing you need to know about these bungee cords is that they are not suitable for the trucking industry. They are intended primarily for light-duty use. Campers and hikers love nylon wrapped rubber because it is very flexible and easy-to-use. It is great for securing a camping tarp or attaching a sleeping bag to a backpack. However, nylon wrapped rubber is not sufficient for holding down truck tarps at speeds approaching 60 mph. You should also know that nylon wrapped rubber is not nearly as thick and it has a significantly lower tensile strength. Attempting to secure truck tarps with these kinds of bungee cords is asking for trouble. Do not use them for anything other than light-duty applications not involving cargo control. The good news for Mytee Products customers is that we have all the EPDM bungee straps and rope you need. You don’t have to go anywhere else to keep your truck well-stocked. You can buy bungee straps in packs of 50, with or without crimped hooks. We also carry rubber rope hooks ideal for drivers who want to construct their own bungee ropes when more length is required. It is that time of year again when growers are starting to think about winter hay storage. Every year, there is that nagging question of whether to go with tarps or store excess hay in the barn. That is considering a grower even has a barn to work with. Those who do not are forced to rely on hay tarps or temporary storage structures. The debate over whether to use tarps or not comes largely from the less gleeful stories we hear every spring about crop loss resulting from tarp failure. The first thing to understand is that no storage solution is perfect. The second thing to note is that much of the effectiveness of hay tarps lies in how they are deployed. With that in mind, below are a few fall reminders for those growers intending to tarp their hay this winter. One of the biggest problems growers face is snow and ice. When a stack is not constructed properly, it allows certain portions of the hay tarp to lay flat and, as a result, collect precipitation. Get enough snow and ice built up and it could be nearly impossible to remove a tarp when hay is needed in early spring. The best way to avoid this problem is to pay attention to how you stack. Hay stacking should really be done in a-frame or pyramid shape if you are planning to use tarps. Giving the stack a sharp enough incline will make it easier for precipitation to roll off. You still may have to go out to sweep your stacks after an especially persistent snowfall, but clearing an inclined stack is a lot easier than clearing a flat stack. It is a lot safer too. Any experienced tarp user will tell you that the key to avoiding most problems is keeping hay tarps tight and secure. Doing so requires that tie downs be checked on a regular basis. Remember that even the slightest bit of wind underneath a tarp can cause big problems in both the short and long terms. Checking once a week should be sufficient. Tie downs should definitely be checked immediately after storms to assess the extent of wind damage. Another common complaint among hay growers is that the grommets built into their tarps fail in severe weather. We suggest a tarp with webbing loops or a built-in sleeve capable of accommodating PVC pipe. Securing tie-downs with PVC pipe results in a much stronger system than tying down with grommets alone. You can still use the grommets along with bungee straps for a little extra strength. Last but not least is the reminder to check all your hay tarps in the fall. Do not wait until you start stacking hay to find out that one or more of your tarps is ripped or torn. Now is the time to address any damage while you’re not under pressure to get that hay cut and stacked. Minor damage can be repaired with one of our tarp repair kits. Major damage, like torn seams for example, may require a more heavy-duty solution. 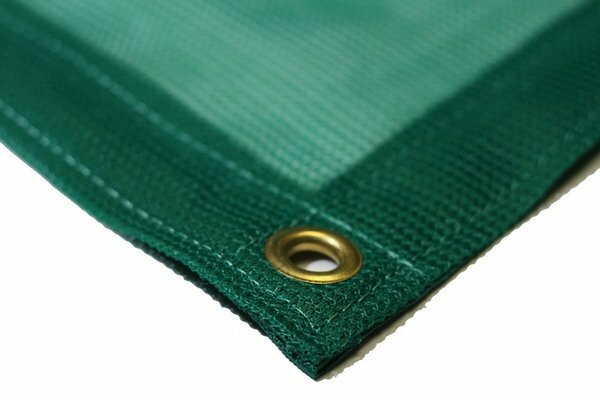 You can obviously browse our selection of farming supplies should any of your tarps need complete replacement. Fall is harvest time in North America. In just a few months, the snow will be flying and the temperatures falling. If you plan to store hay this winter, make sure you are fully prepared with everything you need. Mytee Products carries high-quality hay tarps, spiral anchor pins, and temporary storage structures.